Kids Can Press, 9781554538164, 32pp. Razia is excited when her grandfather tells her there's a school for girls being built in their Afghan village. At last, girls will have the same opportunity to be educated as boys. ?Every night I fell asleep dreaming about going to school like my brothers,? she says. Her grandfather wants Razia to enroll in the school. He remembers a time, before the wars and the Taliban, when educated women in Afghanistan became doctors, government workers and journalists, and how this made families and the country stronger. Razia knows, however, that she will need permission from her father and her oldest brother, Aziz, in order to be allowed to attend the school. She begs her grandfather, ?Please, Baba gi, ask Baba and Aziz if I may go. I must go.? But will her grandfather's words be enough to convince the younger men of the value of an education for Razia? 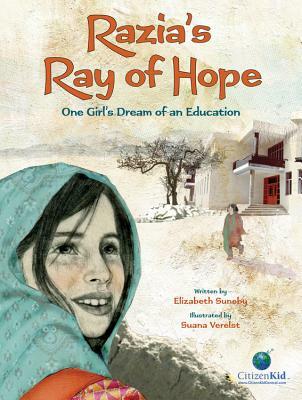 Inspired by real-life Razia Jan's experiences when she built the Zabuli Education Center outside of Kabul, Afghanistan, author Elizabeth Suneby uses a fictionalized story to deftly personalize the plight of many children around the world who are not being educated. The layered, mixed-media illustrations by Suana Verelst add contextual details about life in an Afghan village. This book works perfectly for a social studies lesson on global cultures. Extra resources include an overview of children worldwide who do not attend school, the story of the real Razia Jan, a glossary of Dari words found in the text and activity suggestions. Suana Verelst was born in Antwerp, Belgium, and grew up in Kortrijk, a Belgian town close to the French border. She studied drawing and painting at the Academy of Fine Arts in Sint-Niklaas, East Flanders, before leaving for Canada to continue her studies in Art History, Fine Arts and Graphic Design.